Dr Charlie Bamforth joins me this week to discuss clarity and haze in beer as well as steps you can take to improve clarity through finings, conditioning and brewing techniques. Today my guest is Dr Charlie Bamforth from the University of California at Davis. He is Professor of Malting and Brewing Science where he specializes in the study of wholsomeness of beer including beer perception, polyphenols, foam stability, oxidation and flavor stability. This is Charlie’s 8th appearance on the show. Dr Bamforth tells us some of the new projects he’s been working on along with his new books. He also mentions the short courses in brewing now offered by the University. We talk about the definition of clarity and why it matters for beer brewing. Charlie explains how to measure clarity and haze including direct measurement and observation. We discuss some of the many potential causes of haze in beer. He tells us about chill haze, and how chill haze often develops into a permanent haze. We start on to of the main culprits that cloud beer – polyphenols and proteins. Charlie discusses the selection of malts, malt protein and how to minimize it. We discuss polyphenols which come from both hops and grains. Charlie shares some techniques for reducing haze starting with a good strong boil. We discuss cold crashing a beer and how important that is for improving clarity. Charlie explains some finings commonly used as well as how they work. Thank you to our sponsor Craft Beer and Brewing Magazine for sponsoring this episode. I encourage you to subscribe to their great magazine! And also Anvil Brewing Equipment. Anvil is a new line of kettles, burners and accessories from John Blichmann at Blichmann Engineering. They make top quality brewing equipment built to last a lifetime. 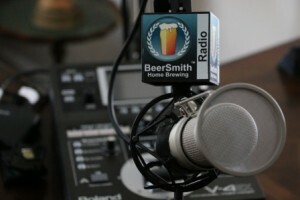 iTunes Announcements: I launched a new video channel for the BeerSmith podcast on iTunes, so subscribe now! At the moment it will only feature the new widescreen episodes (#75 and up). Older episodes are available on my revamped Youtube channel. Also all of my audio episodes are on iTunes now – so grab the older episodes if you missed any. Great Podcast and very informative. Just woundering Dr Charlie mentioned aout the minus one conditioning. I take it that that would be after fermentation? Or is it before? . Regards Darren. Going to -1 C would be done only after fermentation is complete. “Cold Crashing” can really help clean up the beer clarity and flavor quickly once fermentation is done.